Peter Schmeichel is a legend personified – one of the greatest goalkeepers of all times, he has captained his national Dutch team to numerous trophies. He is heavily regarded as one of the greats of the game. The legendary goalkeeper is best known for his eight successful years at Manchester United and for his fierce competitive nature. This nature often didn’t go down well with the opposition team as Schmeichel was quite vocal and never held anything back. Affectionately dubbed the ‘Great Dane’ by soccer fans, he commands hordes of respect worldwide, particularly in Europe due to his successful stints in European clubs winning cups and trophies. Soccer runs in his bleed as his son, Kasper, is also a well known soccer player who plays for Leicester City and the Danish national team. Peter Boleslaw Schmeichel was born in November 1963 in Gladsaxe, Denmark to a Polish father and Danish mother. His early days were spent growing up in the small town of Buddinge Copenhagen, he started playing amateur soccer with the local boys teams. He made his international professional debut in 1984 for the Danish national team’s under 21-s. He then started his club career at Hvivdovre IF, the lackluster team fell a bit short for Schmeichel’s talents – despite his excellent defense the team still under-performed. 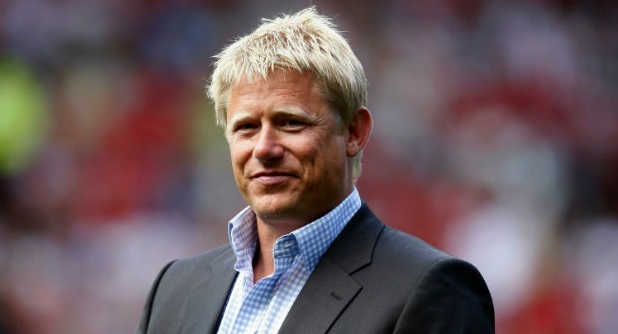 Schmeichel soon moved to another Danish club, Brondby, where his international career truly began. At Brondby Schmeichel won four championships in five years, the most monumental win was the team getting to the UEFA Cup semi-finals in 1991. Soon his talents were noticed by Alex Ferguson who bought him for Manchester United and it is there where his legendary status began. Through the course of his career with United, he became a much-loved figure amongst fans. During his eight years at Manchester United, Schmeichel was the defining body; he eventually became the captain as well. Schmeichel reached the top of the Premier League five times alongside his teammates; he also guided them to three FA Cups and the UEFA Champions League. His success continued for his national side as well where he was part of Denmark’s historic UEFA Euro Champions win in 1992. He is also the most capped player for the Denmark national team, with 129 games between 1987 and 2001. Apart for the Euro 1992 Cup he also played for the 1998 FIFA World Cup and three more European Championships. He was the captain of the national team in 30 matches. The Dane has been voted has the IFFHS World’s Best Goalkeeper in 1992, 1993. IFFHS ranked him amongst the Top 10 Goalkeepers of the 20th Century. In 2003 he was inducted into the English Football Hall of Fame. FIFA named him as one of the 125 Greatest Living Footballers of all times. He has been voted as the Danish Football Player of the Year in 1990, 1993 and 1999. He was also UEFA Goalkeeper of the Year in 1992, 1993, 1997 and 1998. Even World Soccer named him as one of the 100 Greatest Footballers of All Time.